You can definitely do this tour on your own terms, it only uses public transportation. Basically it takes you to a Ferris Wheel, the Osaka castle and a river cruise. Very simple things you can accomplish with Google maps. It stated moderate walking, however is a lot more than that. Being a walking tour, I thought there were going to be more pinturesque sceneries. I do not recommend this tour. well organised, good tourist guide, big town but with very few things to see. Nous avons eu un groupe où les gens se plaignaient de marcher alors que c'est un walking tour. Très franchement, ce ne fut pas du tout une marche fatigante et longue. La croisière ne vaut absolument pas le détour. Je dirais même attrape touriste. Ce que nous avons apprécié, c'est surtout la vue d'Osaka de l'Umeda Sky Building. Le dîner ne fut pas du tout typiquement japonais. Dommage car c'est ce que les touristes recherchent. Le château est magnifique à l'extérieur mais nous avons été stupéfait de constater que c'est un musé à l'intérieur. Intéressant certes mais nous voulions visiter un château! En conclusion, je ne vous conseille pas cette excursion. Faites vous même votre walking tour d'Osaka en incluant Umeda Sky Building à côté de la gare JR, le château et filer passer une fin d'après-midi et soirée dans le quartier de Dotonbori. Nous avons fait ce dernier par nous même car pas dans l'excursion. Là vous ne serez pas déçu!!! This was an interesting tour, wear good walking shoes for this one! Our guide was beyond fabulous, she really cared for her group and was very informative, and kind. The castle was beautiful, and the lunch was ok. Overall it was a good day. Our guide gave us fun insights about Osaka Castle's history and Japanese culture in general. We were impressed with the inside of the castle too - several cool exhibits were in the castle and were very informative, plus they had a nice little gift shop. We felt like the the castle was a bit rushed 50 minutes to see the whole interior was a little fast. The river cruise after seeing the castle was a great way to end the day. 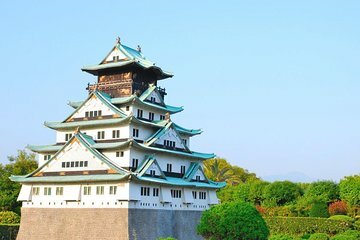 Not knowing the area, we were glad to have a guide with us but some adventurous travelers would probably not have too much trouble visiting Osaka on their own, and taking their time more.